The fourth book of the Selection series has finally arrived! Some of us have been waiting for a year to meet the offspring of much-loved Maxon and America, and I am sure there are tons of girls (including myself) that immediately bought the book the moment it was available, sat down, and read it cover to cover. Now that I’ve finished it, what did I think? Was it good? Did meet my expectations? Well, that’s a complex question. When I started this book I was fully aware of the massive amount of industry demand and expectation that was riding the tails of The Heir. The Selection’s success is hard to truly express, the words “exceptionally well” really fall flat. I mean, it’s The Selection. It’s up there with The Hunger Games and Divergent. Heck, it’s up there with Twilight! I am positive that if a show or movie is ever created (please, please do this WB!!) there will be girls playing the shows on repeat on their DVR/ lining up outside the movie theater in the same droves twilight invoked. That is quite a bit of pressure for one book. Was it as good as the last book in the Selection series? No, it wasn’t. However, I think there is good reason for that. The original Selection story was just that- an original story. That isn’t the case with this new part of the series. Yes, it is a new story with new characters, but Kiera didn’t have the freedom to just create any world she wanted. She had to build a new story around an already existing cast and set. She had to weave the old characters in with the new, and provide enough of the old to entice her readers, while still keeping her new characters as the main focus. She had to make us fall in love with new people, while we were still over the moon about Maxon and America’s happy(ish) ending. Holy Spumoni, that sounds hard! I have to imagine that was a challenge, even for the exceptionally talented Kiera Cass! Right from the beginning this book had so much to surmount, and it showed. I have to be honest, I dredged through the first few chapters. It wasn’t that they weren’t good per se, they just weren’t good in comparison to the first chapters of The One. I didn’t have the same heated anticipation that spurred me to fly through The One, tearing through each page with the vigor of a hungry child. There was nothing I needed to know about Eadlyn yet, because I didn’t yet know her at all. So I set the book down, and I reset my mind. I reminded myself that I wasn’t feverish when I first picked up The Selection, either. The Selection had just been another new book, and that was how I needed to treat this book too. Regardless of knowing who Eadlyn’s parents are, I needed to focus on Eadlyn and not her parents. This was her story, not theirs.With a new additude, I charged on. As the book went on, it grew on me. That doesn’t surprise me, Kiera is great with the build of a story’s crescendo. I don’t like Eadlyn as much as I liked America, but I think I could. I suspect that many people will prefer Eadlyn over America at first. The reason is simple, Eadlyn is a spoiled princess, and America was the very opposite. In fact Eadlyn isn’t just a spoiled princess. SHE IS A SELF CENTERED BRAT!! Eadlyn and America could not be more different. Other than their stubbornness they have almost nothing in common at first glance, simply because they are both the product of very different worlds. Eadlyn was raised to know she was powerful and important. She is spoiled, and why wouldn’t she be? She is the next ruler of I’llea. She grew up in a palace, with an army of servants. Of course she has a bit of a self-important complex. Yet, I see potential in her. I see her mother’s steadfast nerve, and her father’s faith. I see a girl who could be great… if a few things change. One of things that needs to change is the way her parents handle her, and that was difficult for me to absorb. The Maxon and America I knew would never have allowed a daughter to treat people the way Eadlyn treats others… but then again, they seem to be trying to teach her selflessness through the selection. I also want to discuss the boys, of course! I have to say, I am not sure what the outcome of Eadyln’s love life will be. Her love story isn’t as intense as America’s was, but I think it will be. I definitely have a favorite for Eadlyn, but my favorite could easily change. I knew exactly who America should be with pretty quickly, this time it doesn’t seem so obvious to me. The problem is Eadlyn’s crippling fear of falling in love. She puts up walls so people can’t see that she is just a girl, and you can’t fall in love if you don’t let anyone in. (view spoiler)[ I am glad she realized how valuable love is when she saw the photographs in her parents bedroom, and I think Ahren Eloping with Camille also helped her see that love is worth the risk. Ahren’s letter was harsh, but true. She needed to hear it. (hide spoiler)] My favorite picks from the selection are Kile & Henri, and I am leaning towards Kile because the Language barrier is a big obstacle for sweet, perfect Henri to overcome! Of course there is also Eric. He may not be a part of the selection, but he is certainly becoming an important part of Eadlyn’s life. I am interested to see where that relationship goes. Finally there was the ending. It was devastating! I have a love/hate relationship with cliff hangers, but I feel no love for this one. It was cruel. Be warned, you might cry. Overall, this was my least favorite book in The Selection series. I’ll still read the next one, and I think the next one will be much, much better, but I feel like this whole book should have been squeezed into the first half of one book. Eadlyn could have been a little more likable too! However, there were moments that truly moved me, and there are some very quotable phrases in this book. Some of them were so good I had to stop reading and take a breath, just to revel in them. 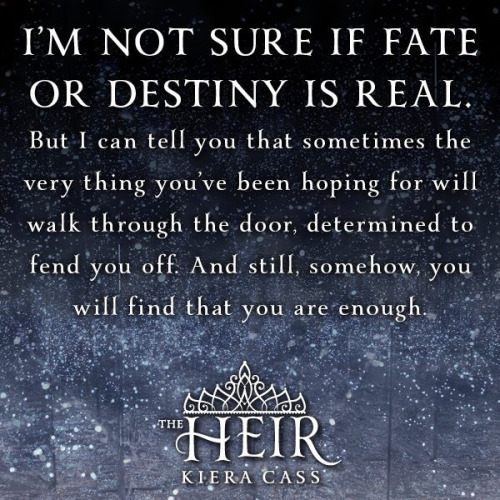 four stars is my final verdict for The Heir! This is a going to be quick review, mostly because it’s Saturday and it’s beautiful outside, but I’ve been wanting to share my thoughts on a lesser known book trilogy that really captured my heart. The trilogy goes by the name The Fallen Trilogy, and it has everything a classic fantasy book needs, including dragons. There is a spunky princess ,a dark bad boy, and a dynamic between them that started from a childhood friendship. I won’t go to any real details because I HATE spoilers, but I will say that there is some serious unrequited love in this book (also, did I mention there are dragons?)! Let me start by saying I love Tess Williams. Her writing style has an old time charm that I really enjoy, and her characters are always well developed. She is also very good at writing from each characters different perspective while simultaneously keeping each perspective individually unique to the character they represent. In more simple terms….She is amazing at switching between narrators! Cyric’s (the bad boy) and Ellia’s (the princess) different perspectives are an important part of this book, and they are both very well presented. In fact, that’s one of the things I loved the most about not only this book, but the entire trilogy. As I was reading, there were so many times I wanted to jump into the pages and yell at the characters! Though that can be frustrating, it certainly kept me involved! The best part of this book was the ending. The dramatic ending is what sold me! So many trilogy’s I have read seem to have a great part one, a mediocre part two, and then a weak, disappointing part three. That was not the case with “Fallen Warrior”! In fact I enjoyed this book the most out of all of the Fallen books. It was great reading about Cyric’s internal struggles, and Ellia’s broken heart. The ending was fabulous, but boy did I have to wait until the VERY end to get the ending I was hoping for. If you are looking for a good indie author read, Try this trilogy out, I certainly enjoyed it! I want to note that Tess sadly passed away last year, and I have missed her presence in the book world! Even though she is gone, she certainly left a mark on my life with her positive outlook and wonderful writing style. Her books can still be found on Amazon.